Haven't read them yet? Check out Incarnate and Asunder. I read Infinite immediately after I turned the last page of Asunder, and I think they work best that way. Infinite picked up right where Asunder left off, with an eruption. With only a breath, the plot swept me away to new dangers. Heart isn't safe--for anyone. Ana is the only one who remembers the truth. Her friends, half in the dark, follow her to the ends of the earth to search for answers. What results is a tense, emotionally devastating journey. I felt overwrought with emotion watching Ana fight for her friends and the newsouls even though her friends doubted her, even though secrets were ripping them apart. I could see Ana from both sides, as the newsoul risking her friends and as the revolutionary stretching her limits for freedom. The fantasy is amped up too. You get dragons, sylph, centaurs, and roc. Sometimes the escapes seem quick, but each encounter emphasizes Ana's (sometimes foolish) bravery. The lengths she'll go. The limits of love and friendship. And through heartache, incredible physical pain, and against the dangers of a crazed cult, she makes a final, mindblowing choice. I closed the book gasping for more. 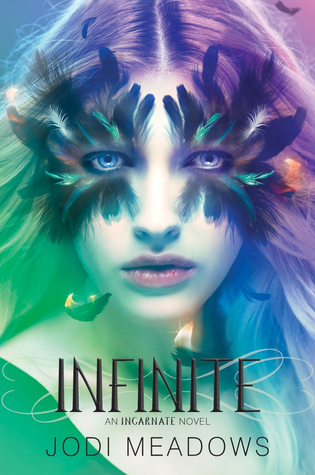 Infinite takes the high fantasy sprawling adventure and gives it new life. Every piece builds together into one breathtaking journey. When the earthquake happens and the cult of angry oldsouls takes over, Ana's only choice is to run, with whomever will follow her. But she's not just fleeing. She has a plan. A crazy, batshit nuts plan. Like, seriously certifiable. Ana could have been crispy-fried multiple times. There are also incredibly cool parts, like the secret of the sylph and the incredible power of music. Not to mention a few hints about Sam's past that are illuminated in surprising ways. I can't say much, but I'm still reeling from how clever Meadows is. The tension in this novel comes part from the race to finish the plan before Soul Night, but a large part occurs between Ana and her friends. Only she and Stef know the price of immortality. Ana struggles between protecting her friends from shame and sharing the truth, and missteps many times along the way. There were moments when Ana was so heartwrenchingly lost and lonely that I cried for her. But it's in these darkest moments that Ana learns to believe in herself and to push outside of her limits. Her encounters with the dragons are thrilling and lead to an epic battle that goes wrong in every possible way, but also very, strangely right. This is a rare time when I appreciated an epilogue. The "official" ending leaves you in shards. The epilogue brings us to that quiet moment in the aftermath so we can let out that held breath and see whether the sacrifices were worth it. Everything building in the first two books comes to a head. If the third has a theme, it is the lengths people will go to to cheat death--whether those people be human, dragon, or phoenix. The horrors that fearful people will accept. The limits (if they exist) on forgiveness and redemption. The difference between protecting our friends and protecting ourselves. This was a huge discovery for Ana, who realizes that she's been sparing her friends pain in part because she can't bear to see them sad. Protecting herself more than them. The more I learned about the world of Heart, the more I recognized it. It made me wonder what I would do if I had been given the same choice as the oldsouls. I don't know that I'd have made the right one. Let no one ever say that fantasy can't deal with tough issues! All the voices become stronger here. Ana has really become her own person. She's not quite there yet, but there's plenty of time for her to grow throughout this book. Before, Ana learned to have faith in other people. Now she must learn to have faith in herself. The transformation she experiences culminates in the final moment that I'll respectfully not share--but it's breathtaking. Then, Sam finally gets angry! Like, really, shudderingly angry. Learning the secret of reincarnation really brings out the true fears and strengths in Sam, Stef, Sarit, Whit, and the others. Which reminds me, Stef and Sarit really become badass. We also lose a lot of dear friends. I cried for them as I would for any other friend. Meadows had done so well in making them real to me. And don't forget the villains. Janan becomes terrifyingly real here, and evil in ways that aren't too far from home. This was a real world to me. A real place where I could imagine myself visiting, full of people I'd like to know more. Give me more Meadows! Even when there were lulls or awkward phrases or stilted voices, they were so rare that I can't believe I'm even mentioning them, except that I'm a stuffy former English major. Meadows shows every sign of future greatness. This, her debut series, is already full of beautiful phrasing, tight pacing, lyrical descriptions, and powerful voices. She gives each character life and she doesn't go overboard on the metaphors. What more could I ask for? Oh, how about realistic dialogue. We get that too. Also, have I mentioned that these are some of the most beautiful covers I've ever seen? One of the best fantasy series of this generation comes to a stunning close. A book I won't soon forget.